Thanks to the kind folks at Universal Orlando, Sam, Mike and I were provided with free park passes to create a magical holiday. I’m thrilled to be able to tell you able it. 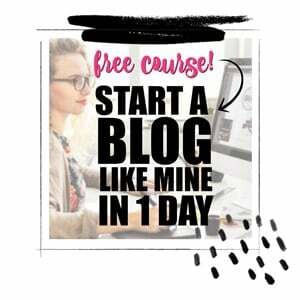 I’m going to have to quote Oprah. She reportedly said “The greatest thing Harry Potter has given the world is the freedom to use our imagination.” I can think of no better way to sum up the three days that Sam, Mike and I spent at Universal Orlando immersed in the Wizarding World of Harry Potter. Sam dressed in a Griffindor robe and scarf, holding his Harry Potter replica want high, as serious as a student at Hogwarts stepped inside the books and movies. And Mike and I were right there beside him. It was a trip of a lifetime that we want to repeat again and again. The Wizarding World of Harry Potter spans two parks at Universal Orlando. 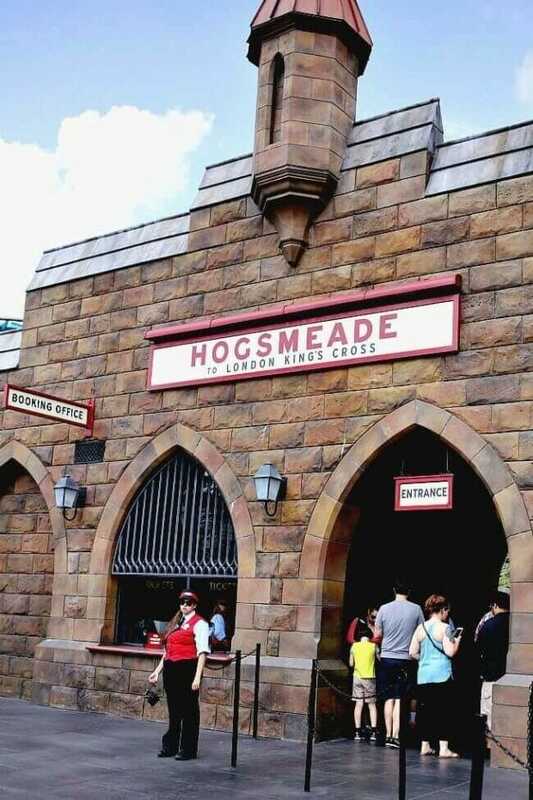 Diagon Alley is located in Universal Studios and Hogsmade is in Islands of Adventure. Any avid Potter fan will know that Diagon Alley is where Harry first went in London to purchase his wizarding supplies for Hogwarts. The replica at Universal is set up the same. 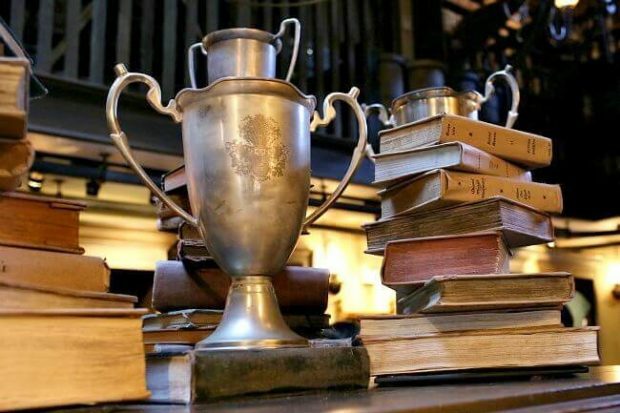 Slipping through the secret passages to get to Diagon Alley, you can find all of the Harry Potter essentials — including butter beer, wands, robes, adorable shops and more. 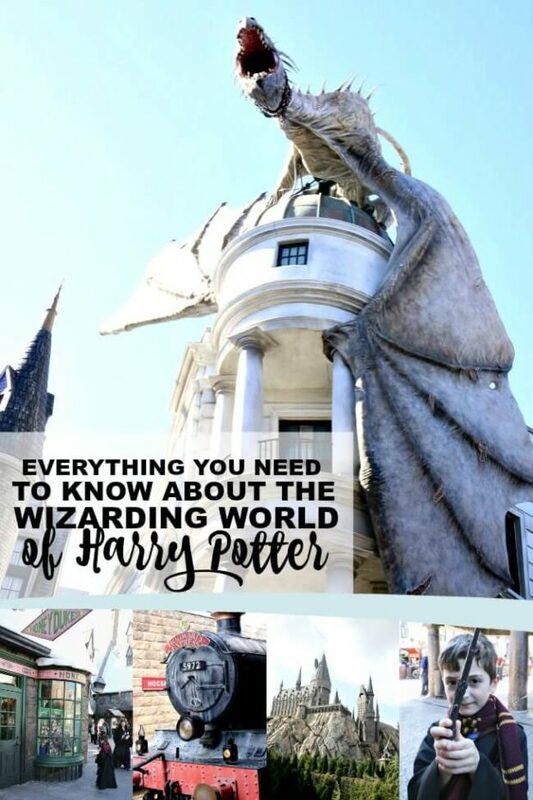 It’s also home to the Harry Potter and the Escape from Gringott’s ride (where you enter below a huge dragon that breathes real fire) — and a few other fun additions including a London phone booth where you can contact the Ministry of Magic. If you remember from the books and movies, Hogsmeade is the wizarding village near Hogwarts school. And it’s also the same set up at Universal Orlando, where the village is beside a massive and detailed replica of Hogwarts. Here you will find a majority of the Harry Potter themed rides including Harry Potter and the Forbidden Journey, The Dragon Challenge, and Flight of the Hippogriff. 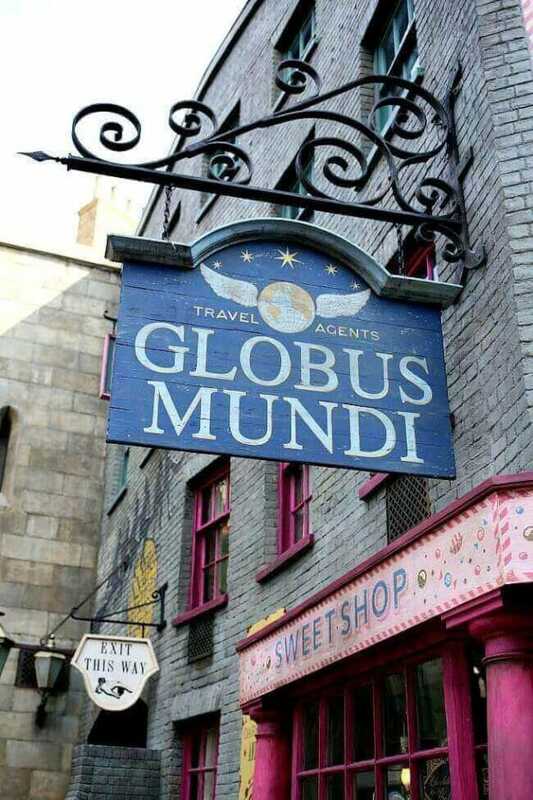 It’s also home to Ollivanders for all of your wizardry shopping needs. 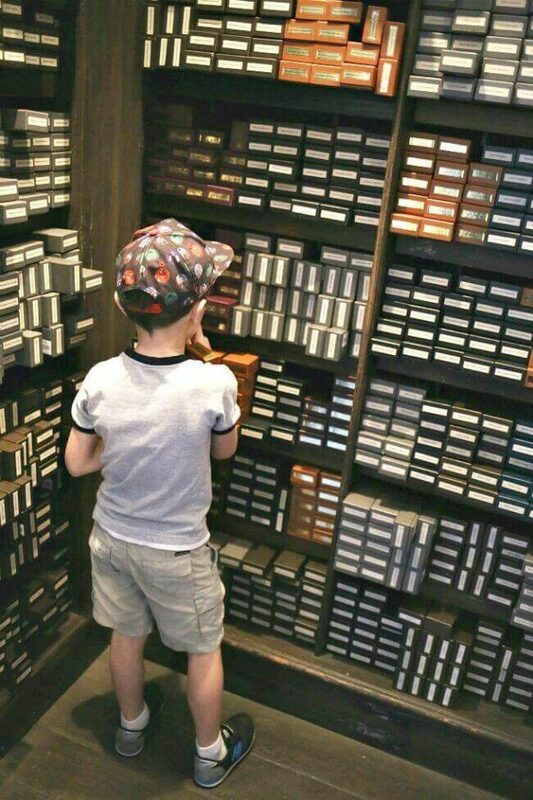 One of the most magical experiences we had was buying Sam’s souvenir wand at Ollivanders. 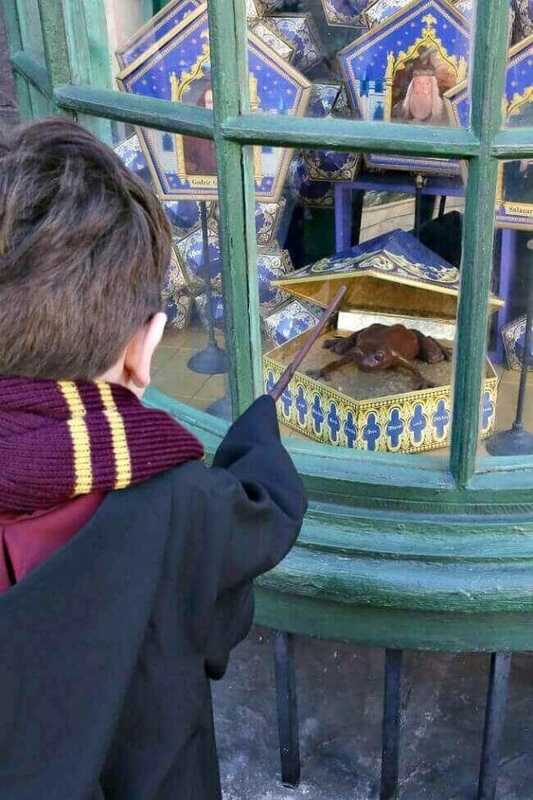 He came knowing that he wanted to get Harry Potter’s wand. But the store was so charming and packed high with so many character wands we loved exploring and looking at each of them. All the beloved characters were represented – and even many of the villains – as well as some of the more obscure characters that only true fans would know. 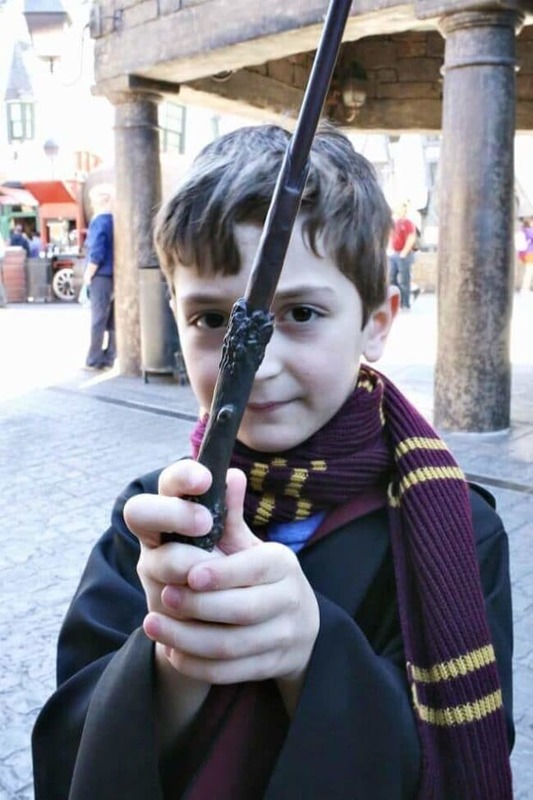 With these special wands, you can stop at marked areas all over Hogsmeade and Diagon Alley to cast spells and interact with the surroundings. Sam was so serious about his spell casting, that I heard other people remark how cute he was. Do you need a two-park pass at the Wizarding World of Harry Potter? In order to have access to both sides of the Wizarding World of Harry Potter, you have to purchase a two park pass, otherwise you are limited to just one side. One of the most common questions I have been asked since we got home is whether it is necessary to purchase a two park pass or if will seeing one park suffice. In my opinion, you don’t NEED to purchase a two park pass in order to get the Harry Potter experience but you will WANT to get one and I can’t recommend it enough. This is especially true if this is your first time to the Wizarding World of Harry Potter. I think our experience was so much the better for having a two-park pass. 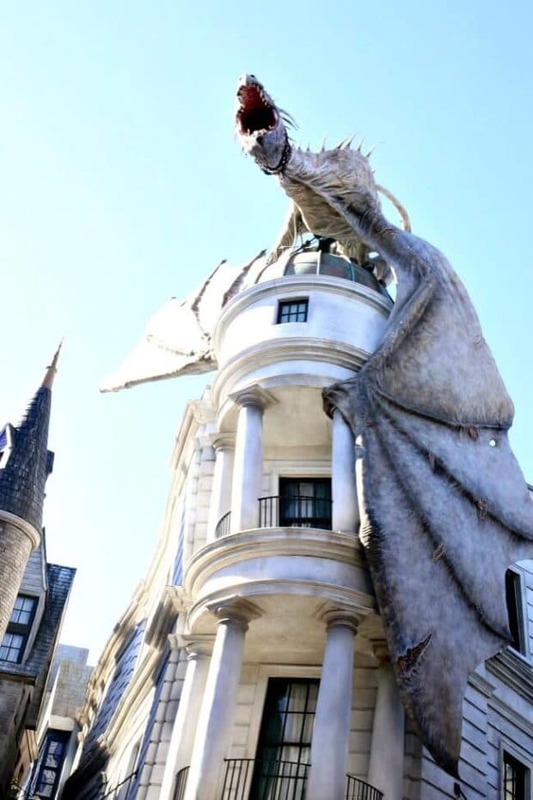 If you only have the budget or time for one park, here’s how you choose between parks … make your decision based on the other awesome Universal attractions outside of the Wizarding World of Harry Potter. For example, if you want to do a lot of Harry Potter experiences along with the Kong, Marvel/Superhero rides (or Dr. Seuss for the younger kids), then the Islands of Adventure would be your pick. We went on the Spiderman ride seven times in three days (!!! ), so, needless to say, the Marvel section of the park was a huge hit with Sam, Mike and me. 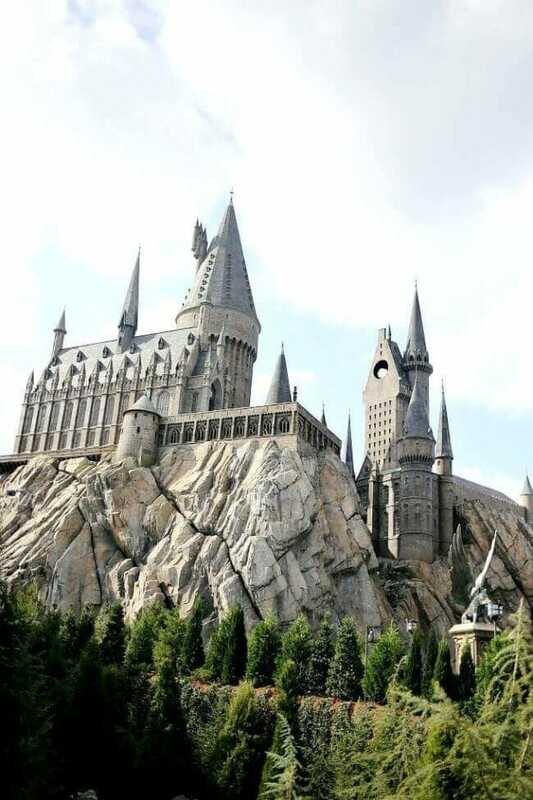 If you only want a taste of the Harry Potter experience and are interested in taking in movie and television themed attractions based around Transformers, the Simpsons and many other popular shows and films, you’ll want to stick with the Universal Studios side. If you are unsure, want a bit of everything or maximum flexibility, definitely go with the two-park pass. Finally, if you are mega Harry Potter fans like we are – do not even think you it, the two-park pass is your option because you won’t want to miss a thing! 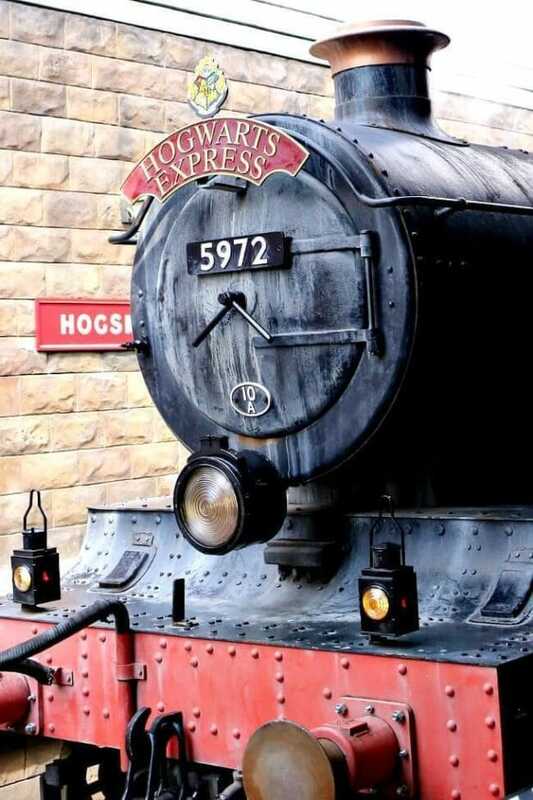 Travelling Between the Two Parks: Is it Worth Taking the Hogwarts Express? Connecting the two sides of the Wizarding World of Harry Potter is The Hogwarts Express. In the books and movies, it is the train the brings the kids from London to Hogwarts. It’s no different at Universal where you experience the train ride Ron, Hermoine and Harry take to and from Hogwarts. If you have never ridden it before, YES. And go both ways. It’s very well done and such a cool experience. All three of us were PUMPED to go through Platform 9 and ¾. If you can arrange it at all, I’d definitely recommend trying to ride the train earlier in the week and earlier in the morning. We were at the park on a Tuesday, Wednesday and Thursday in February. By Thursday afternoon it was extremely crowded. In fact, the Thursday lines for the Hogwarts Express were at least double what they were earlier in the week when we essentially walked up to the train and walked right on. Since we had already been on the Hogwarts Express several times, we actually walked to the other park that day. 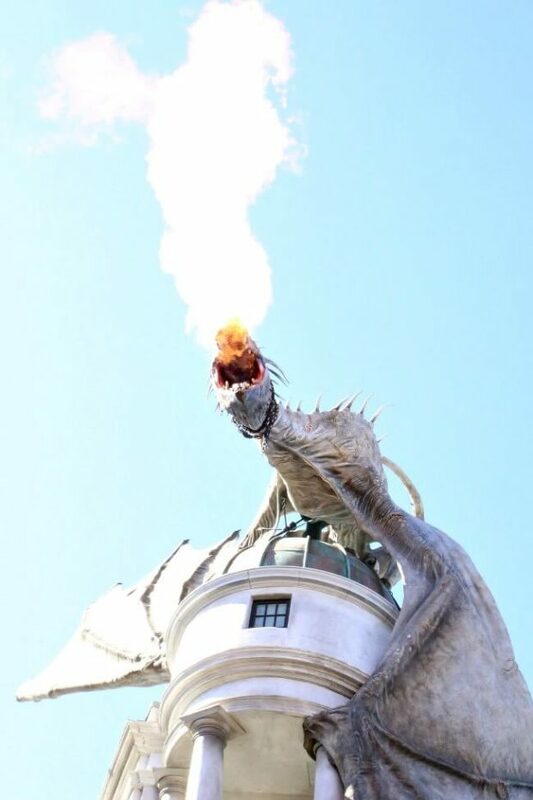 What were my favorite parts of the Wizarding World of Harry Potter? 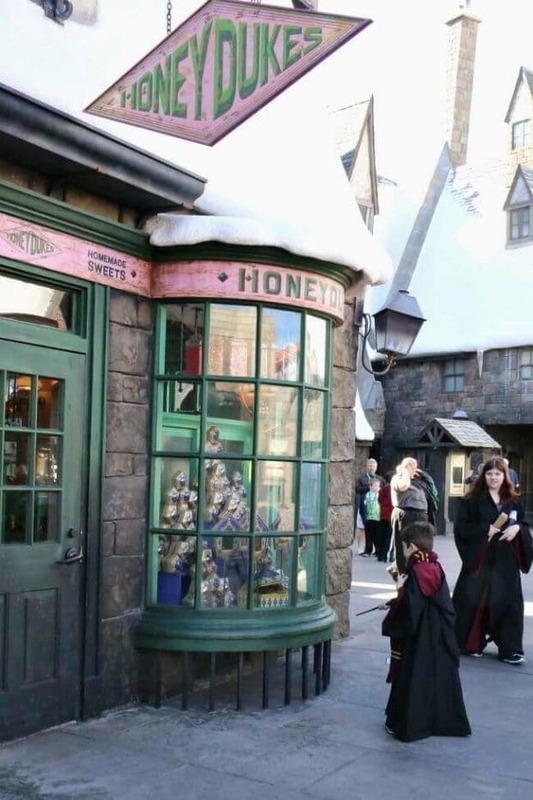 It’s so hard to narrow it down, when every little detail – from the food to the souvenirs to the rides to the styling of the parks — at both Diagon Alley and Hogsmeade is so well attended to. We spent hours and hours at @harrypotteruniversal. It wasn’t just Sam that was entranced, Mike and I loved it as well. We wandered the little shops and swore we were in the movie. Sam really got into the act with a wand, robe and Griffindor scarf. I wouldn’t hesitate to say it’s a total must-do. Thanks to @universalorlando for making it happen. 1. Sam’s Costume: We spent close to $200 on a Griffindor robe, Harry Potter interactive wand and Hogwarts scarf for Sam. I don’t regret it. The quality is insanely good and he’s still wearing it at home. 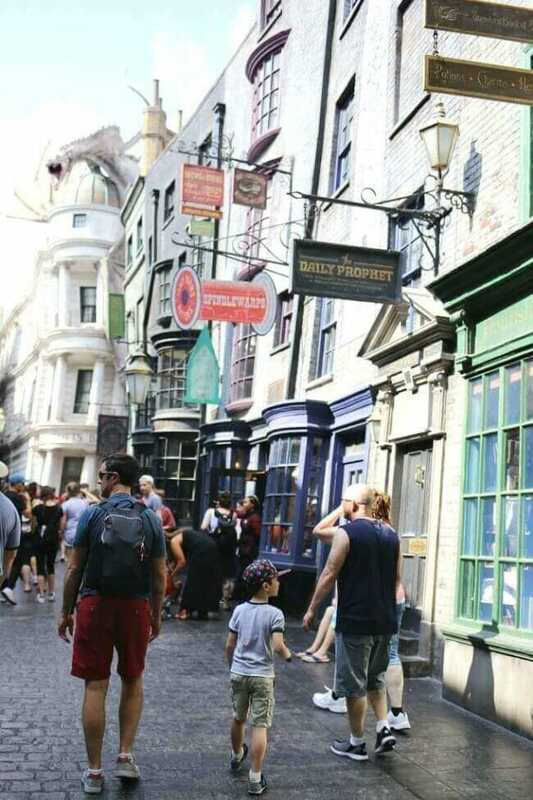 But most of all, what I loved is how it heightened Sam’s experience at the Wizarding World of Harry Potter. The cast members working there interacted with him as though he was a Griffindor Hogwarts student (which he LOVED) and he took the role very seriously. It was adorable. 2. Butter Beer: As soon as we got to the park, Mike and I tried a butter beer. (Sam is a notoriously picky eater, so it was a no-go for him.) You can choose it in liquid form or frozen. I loved the butterscotch-y tasting thick foam on the top. Mike downed his in seconds. 3. Sticky Toffee Pudding Ice Cream: A delicious English Bread Pudding dessert that is drizzled with butterscotch and toffee, then incorporated into ice cream in the most magical way. 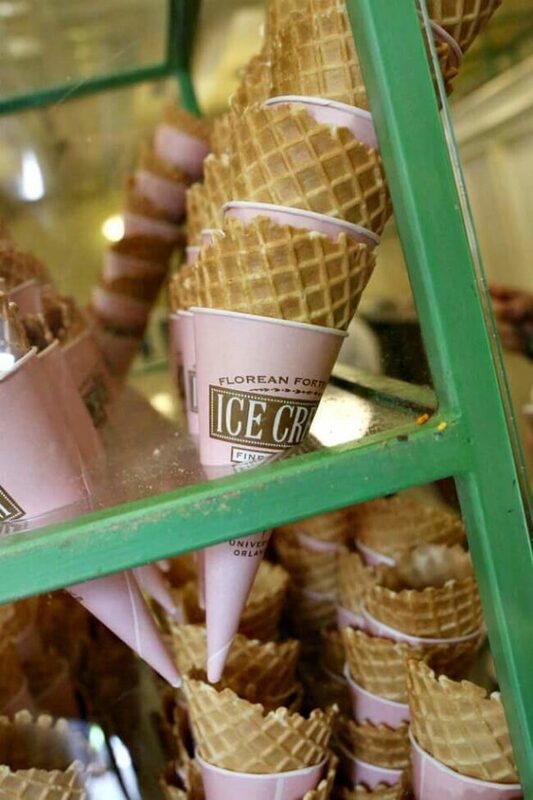 It’s available at Florean Fortescue’s Ice Cream Shop in Diagon Alley and I highly recommend eating it on the steps under the dragon. 4. 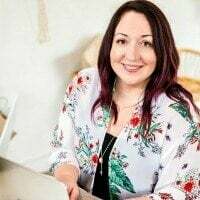 The Styling: When you step into the Wizarding World of Harry Potter it really is like you just step into a completely different world. Everywhere you look, you will see amazing details from the books and movies. If you didn’t even go on a ride or buy a souvenir, the sights, sounds and smells (and people watching) would be worth it alone.